Pipe Debonders can be used in many contexts and many industries to solve difficult repairs and installation issues. The uses and benefits do break down by product type. Below we have outlines some of those usages and benefits. Tight Spots / Tough Jobs: When pipes are buried or behind a wall, the Pipe DEBONDER can solve the repair by extracting the broken pipe and re-using the fitting. This eliminates the need to dig around the pipe or break into the wall to remove the fitting and pipe around it. Installation Mistakes or Upgrades: When mistakes are made and the wrong valve or manifold is installed or plans are altered, Pipe DEBONDER enables the fitting, valve or manifold to be salavaged by debonding and extracting the pipe connected to those fitting pieces. If upgrades are being done, the Pipe DEBONDER can be used to remove old pipe and reuse parts that are still good. Emergency Repairs: In the case of commercial situations like spas, pools, irrigations, plants, etc. time is of the essence. Every minute of down time for the operation, means loss of money and confidence with customers. Pipe DEBONDER is an amazing tool that allows you to quickly solve problems and replumb easily by using good fittings. Maybe you don’t have the new part handy. Pipe DEBONDER is the perfect tool for any emergency situation. There are many ways that the Small & Medium Pipe Debonders SAVE MONEY! Save on Fittings Cost: When you can debond and extract pipe you can save the fittings, valves, manifolds, etc. potentially saving a lot of money. Save on Labor Cost: The time saved on labor can be significant. This means less labor costs. If you are a contractor, this means you can reasonably charge by the job for certain repairs increasing profits. It also means you can use less workers for some jobs increasing your capacity for other jobs. There are many ways that the Small & Medium Pipe Debonders SAVE TIME! Save on Time on Repairs: The Pipe DEBONDER has been shown to cut down the average job in time by about 80%. Save Down Time: Often the cost of the repair itself is not what is significant. It is the overall impact of equipment failure on an overall operation. In almost every situation the time that the operation is down means significant losses of revenue and customer confidence. 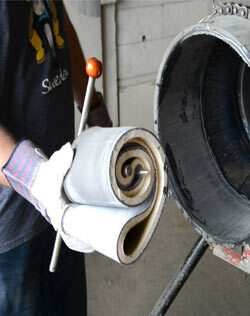 Pipe DEBONDER reduces the amount of down time because of the speed of the repair or installation. This means that the operation is up an running sooner. And that makes everyone happy! Missing a Part: You are far away from supply houses and you need to make a repair, but don’t have the right parts. Don’ drive, DEBOND! Complicated Manifolds: To do the repair you have to cut out an entire manifold. What a headache! It’s expensive, needs to be ordered in, and the operation is in. Don’t Despair, DEBOND! Pipe is Hard to Reach: You are dealing with a leak that is underground. You have to dig deep and around, cut and replace to fix, and this is costly and time consuming. Don’t Dig, DEBOND! The Large DEBONDER has a myriad of uses where large pipe is used. The primary benefit of the technology is that the use of the DEBONDER enables fittings to be salvaged and re-used. With large applications typical fittings can cost $500 to $2,000. Large valves and related manifolds are even more. Save on Time on Repairs: The Pipe DEBONDER cuts down the average job in time significantly because there is less overall work.